In the vast expanse of the English countryside of Wiltshire, the lush green grounds stretch as far as the eye can see. A stray raven lazily circles the sky to find a perch in the vast emptiness. Hundreds of visitors line close to the railing to get into the frame with a monument that has existed for several millennia. They all clamor to capture the majesty of the Stonehenge; a wonder from the prehistoric world that dwarfs you and takes your breath away as you stand in its shadow. Along with Avebury, the Stonehenge forms a part of a World Heritage Site, making it one of the world’s most famous prehistoric structures still in existence today. Massive boulders, the size of 20-30 feet tall, grouped together in a circle, in some semblance of a structure, is what has spiked the curiosity of humans for centuries, begging the questions: What exactly is the Stonehenge? Where did these giant rocks come from and who put it there? Is it just a matter of nature’s design or is there a rational, perhaps ritualistic meaning to the formation? These questions have aroused the interest of historians, archaeologists and scientists alike and since the 12th century, attempts have been made to weave a story about the Stonehenge’s origins and understand what purpose did it really serve. Read on to know more about the history and the mystery of the Stonehenge and why it continues to remain one of the marvels of the world. As a prehistoric structure, the exact date of the Stonehenge’s construction remains shrouded in mystery. However, modern archaeological techniques have been able to establish that the Stonehenge is older than the pyramids of Egypt. The earliest structure in the area surrounding the Stonehenge are four to five pits which seem to have held totem-like posts, erected sometime between 8500 and 7000 B.C. Experts believe that the earliest structure of the Stonehenge as we see it today, came into existence sometime between 3000 B.C. to 2000 B.C., which means that the famous stone circle has been standing tall (literally) for about 5000 years! Stonehenge was constructed over a span of 1500 years or so, in several phases. Several expert opinions conclude that the Stonehenge is associated with some sort of funeral ritual, given the existence of several burial mounds in the vicinity of the Stonehenge. The first phase of the Stonehenge was a bank and ditch arrangement that began somewhere about 5000 years ago or perhaps even earlier than that. The formation was a large circular ditch, which would become what we recognize today as the foundation of the Stonehenge. The ditch is believed to have been dug with tools made of antlers of red deer or maybe even wood. The chalk beneath the surface was then carried and moved away. The ditch was outlined with 56 pits in a circular fashion, known as the Aubrey Holes, which are believed to have originally contained large timber posts. Around and within these Aubrey Holes, cremations seem to have been buried. About 64 such cremations have been found, making it the largest such Neolithic burial ground in the entire British Isles. The first stone circle, which is the inner circle of bluestones, began around 2000 B.C., marking the second phase of the construction of the Stonehenge. These bluestones – called thus because of the blue shade they take on when wet – are believed to come from the Prescelly Mountains in Wales, which is about 240 miles of the Stonehenge’s current location, with each stone weighing up to 4 tons and with 80 such stones being used in the construction. The great mystery that surrounds the bluestones and the sarsen stones is, how were these big blocks of stones transported over such a long distance? One hypothesis, by Garry Levin, engineer and former BBC presenter, is that the bulky bluestones were transported in giant wicker baskets or cages. Groups of four to five men used a contraption of the wicker cages to roll the stones over long distances with the help of oxen perhaps. The same baskets could be used as floatation devices when a river was to be traversed. Another theory is that the sarsen stones may have been slid down the chalk escarpment and the problem of transportation may be simplified if we assume that the stones were moved over slush or snow during successive winters to ease their movement. Early theories attribute the Stonehenge’s construction to supernatural folktales. From giants having built the structure, to magic being used to transport the stones from Ireland, to the monument being the Devil’s handiwork, the Stonehenge has had all types of fanciful and paranormal tales associated with it. One of the first people to record such a tale was Geoffrey of Monmouth, a Welsh cleric who wrote Historia Regum Britanniae (Histories of the Kings of Briton) in 1136. In the book, Geoffrey explains that the Stonehenge was a memorial built in honor of the Briton princes that were slain treacherously by the Saxons. He wrote that King Aurelius Ambrosius was asked by Merlin the Wizard, to collect magical stones from Ireland which were transported back to England and reconstructed to form the Stonehenge, a place that would serve as a burial ground for the British princes and become a memorial for later-day remembrance. When the Britons heard all this, they made up their minds to send for the stones and to make war on the people of Ireland if they tried to hold them back. In the end the King’s brother, Utherpendragon, and fifteen thousand men, were chosen to carry out the task…They made ready their ships and they put to sea. The winds were favourable and they arrived in Ireland. 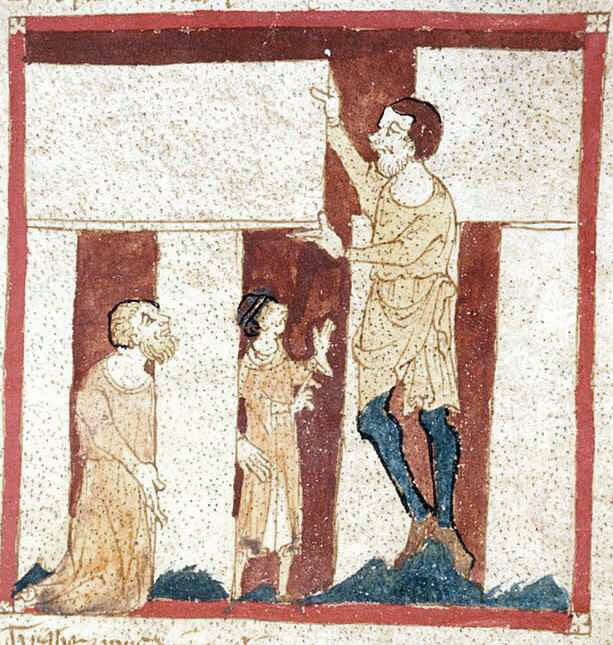 Besides the early medieval story of Geoffrey of Monmouth, John Aubrey proposed the first theory in modern times about the Stonehenge during the 17th century. John Aubrey believed that the Stonehenge was a temple for ancient Druids, built before the Romans came to England. The Druid theory is attributed to an ancient, Earth-based religion and has been closely associated with the Stonehenge for centuries. William Stukeley, an Anglican clergyman further propounded this theory. There is nothing like it, to my knowledge, in all antiquity; and ’tis an original invention of our Druids, an ingenious contrivance to relax the inner and more sacred part, where they perform’d their religious offices. When you enter the building, whether on foot or horseback and cast your eyes around, upon the yawning ruins, you are struck into an ecstatic reverie, which none can describe, and they only can be sensible of, that feel it. One popular theory propounded by Mike Parker Pearson and Ramilisonina, a Malagasy archaeologist is that the Stonehenge was a terminus for a funeral; the funeral procession began in the east during sunrise at Woodhenge and ended in the west at sunset at Stonehenge. The journey undertaken from wood to stone via water symbolized the journey of life and death, with timber being associated with the living and stone being a mark of the dead, for the prehistoric people. More than 50,000 bone fragments from 63 individuals have been excavated at the Stonehenge. These have led experts to believe that the first bluestones may have acted as markers for graves. These burial grounds seem to be the cremation sites of the elite. Objects like a mace head and a little burnt bowl believed to have held incense, suggest that those cremated and buried may have been religious people or political leaders and their close family members. In his 1968 book, Chariots of the Gods, Erich von Daniken argued that the Stonehenge served an even more sensational purpose; it acted as a navigational beacon to astronauts in the ancient times. According to Daniken, the Stonehenge is a model of the solar system, complete with the asteroid belt and true to scale, and even attributes the construction of the Stonehenge to aliens. Another theory that is suggested is based on the way the Stonehenge is aligned; the rising sun at the summer solstice appears exactly over the Heel Stone, making many wonder whether the Stonehenge was some sort of calculator to map solstices and eclipses. The inner stone circle made of 19 stones, in the horseshoe formation, can be used to predict lunar eclipses. By moving the markers along the 30 markers of the outer circle, the lunar cycle can be predicted as well used to determine when a lunar eclipse would occur in its 47-month cycle. …it turned out that professor Thom, since the 1930s, had been hiking all over the British Isles and sailing up the lochs of Scotland to survey the 900 or so other stone circles besides Stonehenge. And he came up with far more extraordinary claims than Hawkins made, that a true science of astronomy had been practiced in Britain some 4000 years ago. That their sky watching had been practiced at a truly mind-boggling level of precision, comparable to that of a modern astronomer. It looked like a sober academic study, and suddenly, the archeological community totally changed its attitude. They took Thom’s work very seriously. and for a number of years, the notion that there were kind of stone age Einsteins operating in Britain really took hold. Four of the sarsen stones at the Stonehenge are carved with various etchings that depict a dagger and axes. A detailed laser-scan of the entire structure has revealed 72 such carvings on the stones, 71 of which are of axes and one is that of a dagger. The assumption is that these carvings were somehow a symbol of either power or status or were in some manner related to the burials in the area surrounding the Stonehenge. In Indo-European tradition, the axe heads are often associated with storm deities and the upward facing blades of the axes may be symbolic of protection of crops, property and people against lightning and storms, thus symbolizing that the carvings were meant to appease the deities. Even though the Stonehenge attracts so many visitors and scientific enquiries, it is not a unique structure. There are remains of thousands of stone circles found all over the British Isles and Northern France. They vary in size; some being only about 9 feet in diameter while some, like the one in Avebury, the largest stone circle in Europe, covers a land spanning 28 acres. Stone circles in England can be found at Cornwall, Devon, Dorset, Somerset and West Yorkshire, among many other counties. The essential definition of a henge is that it features a circular bank and ditch arrangement and is a characteristic construction of earthwork from the Neolithic period. The allure of the Stonehenge has been strong throughout history. During the 18th century, people would scrape off the stones at the site and take the pieces with them because they believed that the stones had healing powers. The flood of visitors passing through the visitor center at the Stonehenge increases every year. About one million visitors are estimated to visit the Stonehenge annually in recent years. One of the largest events that takes place on this site occurs on June 21st, the mid-summer’s day, which in 2009 witnessed the largest number of gatherers, a total of 30,000 people on a single day. These visitors gathered to watch the sunrise over the Heel Stone. If you were standing at the right spot inside the Stonehenge, on the day of summer solstice, i.e. on June 21, facing in the northeasterly direction, you will be able to see the sun rising exactly above the Heel Stone, a phenomenon that holds fascination for a growing number of visitors to England. When the Stonehenge was first opened to visitors for public viewing, people could walk among the stones. But since 1977, the stones have been roped off because of degradation and erosion of the stones. Visitors can now see the monument from about a short distance away, but only special access will allow you to get you close enough to touch the stones.